Q1. Define the term ‘biosphere’. Life supporting zone where atmosphere, hydrosphere and lithosphere interact. Q2. List two biotic components of biosphere. Q3. State the term used to describe bits of decayed living organisms present in soil. Q4. Name any two air pollutants produced by burning of coal and petroleum. Q5. Suggest a way of bringing underground water to the surface of earth. Q1. Which symbiotic life forms can grow on stones and help in the formation of soil? Write the mode of their action for making soil from rocks. Lichens is the symbiotic life forms. Lichens secrete organic acids, which develops cracks in stones. Q2. Name two measures that can be taken to reduce water pollution. Garbage should not be thrown into water bodies, all industrial wastes from the factories should be treated before releasing into river or water bodies. Q3. Name the two gases given out by burning of fossil fuels which dissolve in rain water to form acid rain. A part of the sunlight that falls on the earth is reflected back in the form of infrared light. This infrared light is absorbed by the carbon dioxide molecules present in atmosphere. Due to increase in CO2 concentration in the atmosphere, larger proportion of the infrared rays is trapped by CO2 molecules. This phenomenon is called the greenhouse effect. Q1. Name the three constituents of abiotic component of the biosphere. Explain their major role in biosphere.  The three provide support to all living organisms which constitute biotic component of biosphere. Q2. How are clouds formed? Explain in detail. Cooling of water vapour as it goes up and formation of droplets. Low temperature brings about precipitation. Q3. Water is essential for life? Why? State three points. (i) It regulates body temperature. (ii) All cellular processes take place in water medium. (iv) transportation of nutrients through blood; excretion of waste. Q4. The fish in a lake near an industrial city suddenly dies. State thee reasons. (i) Addition of undesirable substances like pesticides, poisonous salts etc. (ii) Removal of nutrients, depletion of oxygen. (iii) Sudden change (rise) in temperature due to hot water released by factories. Q5. State briefly three harmful effects of burning of fossil fuels. (i) Presence of high levels of suspended particles like unburnt carbon particles in the atmosphere, cause visibility to be lowered. In cold weather when water condenses out of air. This forms smog. (ii) It increases the incidences of allergies, cancer and heart disease. (iii) On burning oxides of nitrogen and sulphur are formed. They dissolve in rains to give rise to acid rain. Q6. (i) Though large oceans surround the land masses, the water needs to be conserved. Explain. (ii) How is the life of organisms living in water affected when water gets polluted? (i) Marine water is not useful for human and plant life directly, Uneven distribution of limited fresh water resources need conservation. (ii) Dissolved waste in water cause pollution. It increases the temperature of water and availability of dissolved O2 in water gets reduced. It results in the death of aquatic life. Q1. (i) How is gaseous nitrogen fixed by the plants? (ii) Schematically depict nitrogen cycle in nature. (iii) Mention any one difference between nitrogen fixation and nitrification. 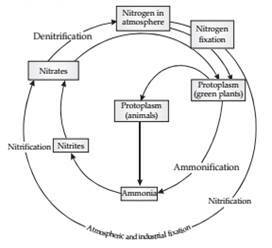 (iii) Nitrification is conversion of ammonia to nitrites/ nitrates. 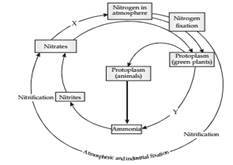 Nitrogen fixation is conversion of atmospheric nitrogen to compounds of nitrogen. Q2.  (a) Explain the Biological and physical methods of nitrogen fixation. (b) (i) Complete the nitrogen cycle in nature by labelling ‘X’ and ‘Y’ in the biogeochemical cycle shown below. (a) Biologically nitrogen is fixed by the bacteria living in the root nodules of leguminous plants and physically fix through lightning. (b) (i) X = Denitrification, Y = Ammonification. (ii) Denitrifying bacteria convert the nitrate compounds back to nitrogen which releases into the atmosphere. This process is called denitrification.